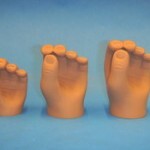 • The ALPHA, BETA and GAMMA Hands are made from soft, flexible, durable polymers. 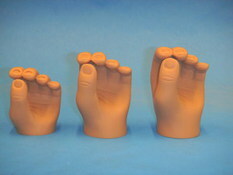 • All the models are very realistic hands with finger features molded into the surfaces. • Perfect for crawling and bi-manual object control and passive object holding. • 3 models for ages from six months to 36 months old.